It takes an exceptional talent to win a grand tour at just 24 years of age and no one has won a three-week race at such a young age since Damiano Cunego became a surprise winner of the 2004 Giro d’Italia. However, Nairo Quintana confirmed his exceptional potential earlier last year when he coped with the pressure of being the major favourite and took a very dominant victory in his maiden Giro d’Italia. Ever since his victory in the 2010 Tour de l'Avenir, it has been evident that Quintana is a very rare talent but it has come as a surprise for many - even his own Movistar team - that he has matured into a winner candidate already at 24 years of age. However, his excellent performance at last year's Tour de France convinced manager Eusebio Unzue and the rest of the cycling world that he wasready to target the top step of the podium and the wily Spaniard selected a Giro team that was fully devoted to their young Colombian. Quintana paid back the confidence in the most impressive fashion as he overcame that could have sent him out of the race or taken him out of GC contention before stamping his authority on the race with a dominant performance in the final week. It has been a rapid rise through the ranks for Quintana who joined the WorldTour just two years ago when he signed with his current team. In his first year, he proved his talents when he won the Vuelta a Murcia in the early part of the season but he first made a name for himself at the highest level when he won the queen stage of the Criterium du Dauphiné. While the Sky machine was powering along at a brutal pace that prevented the likes of defending Tour champion Cadel Evans from attacking, Quintana took off on the Cold du Joux-Plane, and by using both his great climbing and descending skills, he held on to take a breakthrough solo victory. He went on to win the Route du Sud a few weeks later and those performance raised the expectations for his debut at the Vuelta a Espana. Already that year he introduced his habit of preparing his three-week races with limited racing and intense training in Colombia but his first attempt was a clear miss. Entering the race, he wasn't firing on all cylinders but bounced back with an excellent domestique performance in the mountain stages in the final week where he emerged as the fourth best climber behind the superior trio of Alberto Contador, Joaquim Rodriguez and his captain Alejandro Valverde. He made use of his post-Vuelta condition to take his first big classics victory at the Giro dell'Emilia which created lofty expectations for his 2013 season. A crash prevented him from excelling at Paris-Nice but he got his deserved place in the spotlight when he beat riders like Rodriguez, Valverde and Bradley Wiggins in the first big mountain stage of the Volta a Catalunya. A time loss on a descent on the first day meant that he could only manage fourth in that race but his excellent condition prompted the Movistar management to change his schedule and line up their upcoming star at the Vuelta al Pais Vasco. That race proved to be the major breakthrough for the tiny Colombian as he ended up taking the overall victory. Not only did he climb at his usual high level in that race, he secured the win by doing an excellent time trial on the final day. That performance made him a dark horse for the Tour de France and the excitement was made even bigger by the fact that he arrived at the race straight from Colombia, with no one knowing anything about his condition. Even though he was widely tipped as an outsider, few would have expected him to perform as he did during those three weeks in France. Entering the race as a luxury domestique for Valverde, he was used to animate the race and test Chris Froome in the Pyrenees but when Valverde had his horrible day on the windy roads to Saint-Armand-Montrond, he took over the captaincy role at just 23 years of age. Quintana coped with the pressure and ended the race in second overall after winning the final big mountain stage, even taking the mountains jersey in the process. In the final week, he was even stronger than Froome on the climbs and if he had been racing more conservatively in the Pyrenees, he would have been a lot closer to the win. Even if he had started the race as team captain and had raced as such, however, he would never have been able to beat the superior Brit who was far stronger than the Colombian until the final week and had a clear advantage in the time trials. With Quintana having lots of room for improvement, cycling fans were looking forward to his return to La Grande Boucle and a much closer battle between the two grand tour stars. However, his team made the - probably wise - decision to allow him to mature under less pressure at the Giro than going straight after the win in the sport's pinnacle event. The decision was clearly against Quintana's own desire to return but a couple of factors contributed to the decision. First and foremost, Unzue is convinced that it will be easier for his young star to handle the pressure of being a race leader for the first time in a race with less media attention. Secondly, he wanted to give Alejandro Valverde one final chance to reach his life-long dream of stepping onto the Tour de France podium. However, the decision clearly wasn't an easy one for the team to make. The official announcement wasn't made before late January as sponsor Telefonica were clearly keen on seeing Quintana return to the Tour. Despite his reluctance, the Colombian accepted his schedule and carefully prepared the Giro in his trademark way by returning to Colombia without doing any racing since he ended the Volta a Catalunya in a fine but unspectacular fifth. He returned to Europe with a bang, confirming his potential by taking his first grand tour win. Many teams would hold back a rising grand tour star and not put him under the physical and mental pressure of targeting the GC in another grand tour in the year of his maiden three-week victory. However, with the Vuelta a Espana being of great importance for the team, Movistar decided to bring their rising star to the Vuelta as well, taking aim at what would be an impressive second grand tour victory in the year he opened his account. Many were looking forward to that race as a chance to see how Quintana would fare against Contador and Froome and things were looking good for the Colombian who used a team time trial win for Movistar and solid showings in the first two mountain stages to ride himself into the race lead. He was about to lose considerable ground in the time trial before he crashed out of contention, losing a significant amount of time. As he crashed again in the next stage, he was forced to abandon, ending the race as just another favourite to leave a grand tour prematurely in a crash-marred 2014 season. Already last year it was clear that Quintana would be the Movistar captain for the Tour in 2015 and his entire season has been one steady build-up for the big goal in July. He was slightly off the pace in San Luis which marked in comeback after his injury and missed out on some racing after he crashed at the Colombian national championships in early February. However, he returned with a bang by winning the queen stage and the overall at Tirreno-Adriatico with a huge solo attack on a snowy day on Monte Terminillo. The Italian race had a formidable line-up that included both Nibali and Contador but no one was able to follow the tiny Colombian. However, that day marked the only occasion where Quintana has shown promising signs in 2015. In fact, he delivered surprisingly poor performance in both Vuelta al Pais Vasco and the Tour de Romandie and especially the former race had been a big goal for him. Since then he has followed his usual pattern of preparing for his big goals in Colombia, only returning to racing at the Route du Sud. He had a strange approach to that event where he was clearly content with following Contador on the Port de Bales. He never seemed to be troubled by the Spaniard’s many attacks but he didn’t try a single move himself before he got distanced on the descent and had to settle for second. With the mountainous course for the Tour, many have put Quintana at the top of their list of favourites and it is certainly true that most of the route suits him well. Among the Fabulous Four, the Colombian is by far the poorest time triallists and so he clearly benefits from the extremely small amount of individual riding against the clock. The time gaps in the opening test will be pretty small and it will be the combination of the mountains, the tricky opening week and the team time trial that will decide the race. In his first grand tours, Quintana has clearly proved that he has the mental strength and the consistency to win a grand tour but he still hasn’t shown that he has the top level to beat the likes of Froome and Contador in the mountains. For most of the time, he was at least one level below Froome in the 2013 Tour and even though he won the 2014 Giro, he didn’t win that race in the expected superior manner. Of course he was set back by illness in the first part of the race but when he returned to form in the final week he rode a pretty conservative race. He produced one outstanding performance in the Gavia-Stelvio stage but it is hard to say how much time he would have taken if the favourites had been together at the bottom of the final climb. He won the mountain time trial but had to go to the very limit of his capabilities to beat Fabio Aru. In the remaining mountain stages, he was content with following wheels, even on the Monte Zoncolan where he had no reason not to stamp his authority on the race. The Vuelta confirmed the impression that he is one step below the very best. It is fair to say that neither Contador nor Froome had had the best preparation for that race while Quintana had had the ideal build-up. Nonetheless, both riders were stronger than the Colombian in the first mountain stage of the race and his stint in red was only due to Movistar’s team time trial victory in the opening stage. This year’s below-par showings only confirm the trend and especially the performance in Pais Vasco stands out as a huge disappointment. Only his great ride in Tirreno-Adriatico was promising but it was later evident that neither Nibali nor Contador were close to their best in that race. To add to his woes, Quintana is probably the one of the four pre-race favourites that will have the hardest time in the first week. The tiny Colombian doesn’t like the hard fight for position and even though Movistar have a solid team, they have never really excelled in the northern classics. Quintana tested himself on the cobbles in Dwars door Vlaanderen and E3 Harelbeke and even though he delivered decent performances in those races, he was clearly not at the level that his teammate Alejandro Valverde had shown 12 months earlier. It will be a huge surprise if Quintana doesn’t lose time to Nibali in stage 4 and he could find himself with a significant time loss before we even get to the mountains. Fortunately, he should be able to do well in the team time trial as Movistar have always been among the strongest in hilly TTTs. On the other hand, all the four pre-race favourites are part of teams that will shine on this course and there is no guarantee that Quintana won’t end up as the loser in stage 9. One of his assets is his team. Froome is the only other pre-race favourite who has a teammate that can realistically finish on the podium. 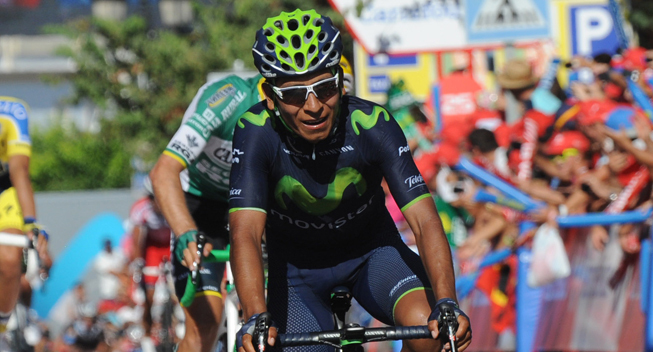 Together with Alejandro Valverde, Quintana is part of a very strong duo that have cards to play in the mountains. However, while the rest of the team is made up mostly of strong climbers, there is quite a gap between the level of the two leaders and their strongest domestiques. Furthermore, it remains to be seen whether Valverde is really willing to sacrifice himself for his leader instead of riding to achieve his life-long goal of a podium spot in Paris. There is no doubt that Quintana has a great future as a grand tour rider and he is very likely to win the Tour at some point of his career. However, this year’s race may come a bit too early as nothing really suggests that he will be able to drop his key rivals in the terrain where he has to make the difference: the high mountains. On the other hand, Quintana is still work in progress and no one really knows how far he can get. He will definitely improve in the next few years and he is likely to be stronger than ever during the next three weeks in France. If he can add another level to the one he has shown in the past, it won’t be impossible to win the world’s biggest race at just 25 years of age. During the early part of his career, it was not at all obvious that Joaquim Rodriguez would develop into one of the best grand tour riders in the world. Being a formidable classics rider and stage hunter in the biggest races, he was hugely inconsistent during the three-week events and was mostly unable to handle long, gradual climbs as opposed to the short, steep ramps on which he thrived. A dedicated effort to develop into a rider also for the high mountains, improve his poor time trialling ability immensely and get rid of his numerous bad days has seen him step onto the podium in all three grand tours, with his 3rd in the 2013 Tour de France finally making the plate full. He had come close on a number of occasions but in 2012 he finally stepped into the world elite of grand tour riders. He avoided his usual bad day in both the Giro at the Vuelta and he even finished 7th in the long time trial at the latter race - a performance that was not even comparable to the one that had seen him lose more than 6 minutes two years earlier. While his climbing was not outstanding at the Giro, he was doubtlessly the best rider in the Vuelta mountains and only a bold move by Contador in an intermediate stage that was completely unsuited to Rodriguez' characteristics, saw the Katusha rider miss out on the win. As a pure climber, Rodriguez seemed to be without a chance to ever w win the Tour de France which is often loaded with flat time trialing and so his grand tour focus has mostly been on the Giro and the Vuelta whose mountainous natures suit him down to the ground. In 2013 an unusually hilly Tour de France course made him skip his usual Giro-Vuelta double and make his only second appearance at the world's biggest bike race in a quest to achieve the rare feat of finishing on all three grand tour podium. He rarely fails to hit his best form for the biggest targets but he performed unusually poorly in the Pyrenees before a very strong comeback in the difficult final week allowed him to accomplish his mission when a strong ride in the final mountain stage allowed him to finish on the podium. However, the grand tour victory that so narrowly eluded him two years ago, is still missing on his palmares, and last year he changed his focus back from podium aspirations to a dedicated quest to win the Giro and/or the Vuelta. For Rodriguez, another second place has little value: this time it was all about the overall victory. Knowing that he has a heavy racing burden ahead of him, Rodriguez scaled down his spring racing significantly and he arrived at the Giro with fewer racing kilometres in his legs than ever before. For the first time, he skipped both Paris-Nice and Tirreno-Adriatico and he didn't make his usual appearance in the Vuelta al Pais Vasco either. In fact his only racing between a rather heavy early-season block that ended at the Tour of Oman in late February and the Ardennes classics in late April, was his home race, the Volta a Catalunya. That race, however, suggested that Rodriguez was on track for big things. With its lack of really long hard climbs, the course may have suited him well but it was an impressive performance for him to come away with the win in what was arguably the strongest field assembled for any week-long stage race that year. He not only beat his Giro rival Nairo Quintana, he also held off a resurgent Alberto Contador who had crushed the opposition in Tirreno-Adriatico less than two weeks earlier, and - an albeit underprepared - Chris Froome. Much has been said about the bad luck that plagued Chris Froome’s season but Rodriguez was not spared anything either. For the second year in a row, an in-form Rodriguez crashed out of the Amstel Gold Race and he hit the deck again a few days later in the Fleche Wallonne. At the time, he played down the importance of the incidents but when he abandoned the Liege-Bastogne-Liege, it was clear that something was wrong. In fact, Rodriguez had fractured a few ribs but he decided to keep his vulnerability as a secret. He lined up at the Giro hoping to limit his losses in the first week while his bones were still healing but when he took another tumble in stage 6, fracturing another few ribs, the race was over for the Spaniard. Rodriguez had barely left Italy before he announced that he would now go all in for the Vuelta. Due to limited racing opportunities in the summer, his team decided to send him to the Tour de France where he would target a stage win and the mountains jersey. However, the main objective was to build form for the Spanish grand tour and even though his form was clearly not good enough to achieve his goals results-wise, his efforts had clearly paid off. Less than one week after the final stage to Paris, he dropped everyone else on the final climb in the Clasica San Sebastian to prove his return to his top level. That made Rodriguez confident for the Vuelta but the Spaniard never reached his top level in his home race. On every occasion, he came up short against the likes of Froome and Contador and had to settle for a disappointing fourth place that was far from his lofty ambitions at the start of the race. This year Rodriguez has made a gamble. With the minimal amount of time trialling, he will never get a better chance to win the Tour de France. However, all the greatest riders will be at the start of the French grand tour and Rodriguez needs a solid bit of luck and be stronger than ever before if he is to come out on top. To reach his goal of winning a grand tour, it would probably have been wiser to put all the eggs in the Vuelta basket – the long time trial in the Giro made that race unsuited to him – but he has been unable to resist the temptation to the return to the Tour for the third year in a row. In 2015 his ambitions are vastly different from the ones he had 12 months ago. Back then, he didn’t even look at the GC as it was all about building condition for the Vuelta. This year the Tour is the biggest goal of his season and even though he also plans to ride the Vuelta, the French race is on top of his priorities. The season has been a mixed one for Rodriguez who rode surprisingly poorly in the first part of the year. When he finally started to show some form, he was set back by illness and had to skip the Volta a Catalunya. Instead, he did the Vuelta al Pais Vasco and that turned out to be a wise decision as he ended up taking his first ever victory in a WorldTour stage race that included a time trial. In fact, Rodriguez laid the foundations for his win in the final TT which again underlined his progress in the discipline even though the extremely hilly course with numerous brutally steep climb was evidently a very special one. The performances made Rodriguez one of the big favourites for the Ardennes classics but in those races whose have always been his preferred events, he never found his best legs. Even in the uphill sprint on the Mur de Huy where he is usually the best in the world, he was not even able to finish on the podium and he ended the spring with mixed feelings. In fact, it seems that Rodriguez has not been at his best level since he won last year’s Volta a Catalunya, mainly because he has been set back by injuries. However, at 36 years of age, Rodriguez is also approaching the end of his career and there are no guarantees that he will ever rediscover those excellent legs he had a few years ago. Nonetheless, there are signs that Rodriguez is on track for a great Tour. In the past, he has rarely been very strong in his preparation races but this year he was riding unusually well in the Criterium du Dauphiné. Despite losing a significant amount of time in the time trial, he finished 8th overall and seemed to get better and better as the race went on. That’s a vast difference compared to 2013 when he was only 16th in the same race and went on to match Froome and Quintana in the mountains in the final week of the race. Based on his performances in France, it is no wonder that Nibali has pointed to Rodriguez as the rider who can create a surprise during the three weeks. However, it is still hard to imagine that Rodriguez will be able to win a race with such a strong line-up. Even in his greatest moments, he has never been able to beat Froome and Contador when those two riders have been at 100% and it is hard to see him turn that around at the ripe age of 36. Furthermore, he is likely to suffer massively in the nervous first week where he could pay a costly price in the big fight for position and on the cobbles where he will definitely lose time to a rider like Nibali. Of course the short, punchy finales suit him well and there may be a stage win in store for him on the Mur de Huy but overall the first week is a disadvantage for him. If one adds the fact that his team for the team time trial is not the strongest and there is an opening time trial, he is likely to find himself with a lot of time to make up before we even get to the mountains. Furthermore, Rodriguez is the only pre-race favourite who has to share the leadership role with a sprinter. Alexander Kristoff is targeting the green jersey and half of the team is devoted to the Norwegian. In fact, the team chose to put their sprinter in the central position on the photo that revealed their roster, indicating that the sprints are the top priority. Rodriguez only has Tiago Machado, Alberto Losada and Giampaolo Caruso at his side in the mountains and he will miss his usual lieutenant Daniel Moreno. Hence, he finds himself in the unusual position that Katusha are unlikely to be a key force in the mountains. Rodriguez’ main assets are his great experience and his punchy climbing skills. The many short, steep climb may provide him with a chance to pick up a few bonus seconds along the way. On the other hand, he won’t benefit from the fact that the decisive stages come in the Alps whose longer, less steep climbs don’t do him many favours. He may have improved a lot on the long climbs but no one can deny the fact that his terrain are the shorter, less regular ascents. It will be a huge surprise if Rodriguez finds himself in yellow when the race comes to an end in Paris and another podium spot is likely to be the maximum achievable for him. However, another third place will do nothing to satisfy his ambitions as it is the elusive grand tour victory that is his only goal. He may be prepared to risk it all with a big attack in the mountains and as he has flown under the radar, he may benefit from not being too heavily watched. Otherwise he may have to settle for the fight for another spot on the podium and if he manages to again end in the top 3, it would still be a remarkable feat for a rider who has was not born for the grand tours. If everything goes according to the Sky plan, Richie Porte will never be in contention for the yellow jersey. The Australian lieutenant goes into the race with just one job: to help Chris Froome return to the top step of the podium La Grande Boucle. Nonetheless, history shows that it is no bad idea to have a back-up plan in a grand tour and if bad luck derails Froome’s race, Porte will be ready to strike. Sky knows from bitter experience that a team leader not always gets safely through the opening part of a grand tour. When BradleyWiggins crashed out of the 2011 Tour, the team completely lost its purpose and since then the team has often had a couple of protected riders at grand tours. In the 2012 Giro, Sergio Henao and Rigoberto Uran both rode for GC, in the 2012 Tour Froome was protected throughout the opening week, in the 2012 Vuelta Henao and Uran were back-up riders for Froome and the duo had a similar role for Wiggins in the 2013 Giro. That year Porte was intended to play a similar role in the Tour but a bad day in the Pyrenees took him out of GC contention. Last year Porte was set to play a similar role after illness had destroyed his original plans of going for the win in the Giro. When Froome crashed out of the race, Porte suddenly found himself in the position he has always dreamed about: being allowed to lead a major team in the Tour. With a great ride on the cobbles, he gained time on most of his rivals and after a solid showing in the Vosges he was poised to finish on the podium and seemed to be the only rider who could potentially challenge the dominant Nibali. However, bad luck struck again when he fell ill in the Alps and even though he made it to Paris, he was an anonymous shadow of his usual self. Last year’s bad luck in the grand tours seem to be characterize Porte’s relationship with the three-week races. On several occasions, he has proved that he is one of the best stage race riders but for some reasons things simply won’t come together for him in the biggest races. This year his string of misfortune continued when a series of mishaps took him out of the Giro at a point when he was in a position to win the race after a near-perfect first week. For a long time, Porte had shown lofty promises but it was the 2013 season that marked his transition from domestique to one of the best stage racers in the world. After that excellent season that was crownhed with an amazing performance in the Tour de France, all was set for a big breakthrough at the 2014 Giro d’Italia. With an overall win in Paris-Nice, a second place in Vuelta al Pais Vasco and an excellent performance in the Tour de France, the Australian had taken a massive step up and earned himself the chance to lead Sky in the Italian grand tour. With his versatile skills, he was even widely regarded as the biggest threat for pre-race favourite Nairo Quintana. However, nothing went according to plan for Porte who had a real annus horribilis. Everything had seemed to be on track when he cruised to a solo win in the Tour Down Under queen stage. At this point his biggest concern was the fact that the course for Paris-Nice didn’t leave him many chances to defend his title and so he was pleased when he got the call from the team management and was asked to replace an injured Chris Froome as the team leader in Tirreno-Adriatico. From there, everything unraveled for Porte. After a solid showing in the first mountain stage, he fell ill on the eve of the decisive stage and was forced to leave the race. He tried to bounce back in the Volta a Catalunya but after having been distanced already on the first stage, he abandoned. A few weeks later, the team announced that the initial plans of a leadership at the Giro had to be skipped and instead the Australian would line up at the Tour. After very poor performances in the classics and Romandie and a terrible start to the Criterium du Dauphiné, he seemed to be getting closer to his usual level towards the end of the French preparation race. At the start of the Tour de France, he had ridden himself into a great condition and suddenly it seemed like his fortunes had changed when Chris Froome left the race and he got the once-in-a-lifetime chance to lead Sky in the biggest race before disaster again struck. Two DNFs in one-day races ended a lacklustre season for the Sky rider. Determined to turn things around, Porte decided to change his approach. In the off-season, he strictly followed his training schedule instead of doing some of his famous ridiculously long rides, and he kept a firm focus on his diet. The effort paid off immediately as he was already 5kg lighter than usual in November and by the time we got to the start of the Australian season in early January, he was absolutely flying. He made use of his improved climbing to crush the opposition in the Australian TT championships on a very hilly course and went on to repeat last year’s performance of winning the queen stage at the Tour Down Under. In that sense, things were pretty similar to 2013 when he arrived in Europe for the start of his European campaign but the results could not have been more different. In the Volta ao Algarve, he took a fantastic win in the queen stage despite having worked had for teammate Geraint Thomas. He proved to be in a class of his own in Paris-Nice where he both won the queen stage and the Col d’Eze time trial just as he had done it two years earlier. However, the result that boosted his confidence the most, was probably his overall victory in the Volta a Catalunya. He went into the race as a domestique for Chris Froome but when the team leader turned out to be far from 100%, he took his chance. He took the overall lead with a great performance in the queen stage and went on to take his second WorldTour stage race victory of the year. That result was hugely important as he found himself up against Alberto Contador, Rigoberto Uran, Fabio Aru and Domenico Pozzovivo – the four riders that were expected to be his greatest rivals in the Giro. To have been able to drop Contador in the queen stage was hugely satisfying for the former Contador domestique. After a stint at altitude, Porte was back in action in the Giro del Trentino and again he turned out to be in a class of his own in the race that usually indicates who is on form for the Giro. As everybody knows it all came to nothing when a puncture, a time penalty and finally a crash put an end to his campaign in the Italian grand tour. Porte had barely dropped out of GC contention before he first mentioned the possibility of leaving the race to focus on the Tour. Suffering from his injuries, he rode poorly in the time trial and first stage in the high mountains before his team decided to withdraw him from the race on the second rest day. Since then there has been virtually no signs of life from Porte who has recovered from his injuries and focused on his preparation for the Tour. He gave a short interview with Tuttobiciweb at a cyclosportive event in Italy where he claimed to be ready for the challenge of supporting Froome in France. However, he has not done any racing since the Madonna di Campiglio stage on May 24. He was listed as a reserve for both the Dauphiné and the Tour de Suisse, giving his team the option to add him to the start list at the last minute. In the end, they didn’t and as he was not at the Tour de Slovenie either, no one knows how his condition is. However, it would be a pretty big surprise if Porte is not close to 100% of hi capabilities when he rolls down the start ramp in Utrecht. His injuries were not very serious and won’t have set him too much back. He may have done two weeks of grand tour racing earlier in the year but he didn’t do the grueling final week. In fact, he rode the first two weeks very conservatively with the goal of getting to the time trial before showing his real cards. Hence, he never went into the red zone and unlike Contador he won’t be too fatigued from his Giro efforts. No one can deny that Porte has been the dominant stage racer of the year and if he has the legs, he had in most of the spring season he will be up there with the very best. In the Giro he proved that he was able to stay with Contador on the climbs in the first two weeks and in the early part of the year he managed to distance the Spaniard. In the 2013 Tour, Porte and Froome were in a class of their own in the first mountain stage where Contador and Quintana were both distanced. When it comes to pure climbing skills, Porte is probably right below the fabulous four and will provide Sky with options and a strong second card to play. Porte may not be the strongest in the brutal fight for position in the first week but he is backed by a very solid team. Of course they will mostly have their eyes on Froome but Porte won’t be asked to do any unnecessary work during those first 9 days. He will be sitting on Froome’s wheel, ready to strike when the race hits the mountains. If Froome turns out to be strong on the cobbles – no one knows how he is really faring on that surface – the Sky duo can gain significant time on Contador and Quintana in stage 4 as Porte proved to be very strong on the pave in 2014. Furthermore, Sky have a strong team for the team time trial where Froome, Porte and Geraint Thomas will be the powerhouses on a hilly course that suits them well. Porte’s personal opportunities will depend on what happens in the first week. If we get to the Pyrenees with Froome still in contention, Porte will be part of the pace-setting strategy in the mountains. That will probably take him out of winning contention but it won’t prevent him from finishing in the top 10. He knows that his role mainly is to support Froome but he has done nothing to hide that he actually harbours personal ambitions too. The main question mark lingering over Porte is the overall length of the race. Porte has proved that he is a great stage race but there is a massive difference between a one-week race and a grand tour. The key word in the longer races is consistency and that is exactly where Porte has shown signs of weakness. He has not completed a grand tour as a team leader since he finished seventh in his debut grand tour at the 2010 Giro and so he finds himself in untested territory. However, he always seems to have an off-day in a three-week race. Most famously he was far off the pace on the second stage in the Pyrenees at the 2013 Tour de France before bouncing back in the Alps. While the fabulous four are among the most consistent riders in the world, Porte still has to prove that he can handle the strains of a three-week race. Furthermore, it remains to be seen whether he can maintain his excellent condition until the end of the race. He has been riding at a very high level since early January, winning stages and finishing in the top 4 in every stage race he has done. It will be very hard to maintain that kind of form all the way from January to the end of July. On the other hand, the lack of pressure may be in Porte’s favour as he will be flying under the radar, ready to strike if disaster strikes. If Froome avoids any mishaps, he won’t be in contention for the overall win but as last year showed a lot can happen during a grand tour. Porte is one of the select few riders with the skills to actually win the Tour and so he deserves to figure in a prominent position on the list of favourites.